Celebrate the arrival of spring with vibrant colours and cool styles, with these shorts from Blackberrys that boast of a straight cut and a modish design. These have a five pocket design and a zip fly with a button closure that offer the utmost comfort as well as a generous boost of style. 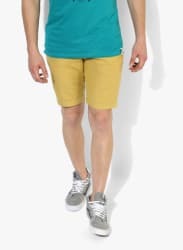 These shorts can be teamed with a pair of grey sneakers and a blue T-shirt.